Yep, Moe did that purely to honor his deal. Wondering what the Aristocrat is gonna do. Ariara actually got cornered, next to an execution block no less. Thankfully the Judge is fighting to subdue, right? Right? Laughing Moe is scary Moe o_O. I doubt he'll Moean about it. The Aristocrat is the wild card here! There's no way Ariara's going to die here. Not after saying that little bit of dramatic foreshadowing. Or I guess that could just be regular run-of-the-mill anger. To some degree, id be worried what sort of "reward" the judge will give. So how far are we from completing the story arc in this castle? I'm not going to give specifics, but I can confirm that I've already concluded this story arc in my buffer. I'm a little worried for the judge here. The guy may be dead, but she still controls the dagger and he is still facing the other way. Plus, Ramien seems pessimistic- it could just be that Moe turned the tide, but I don't think that everyone is out of the woods yet. Will the castle still stand when its story arc is completed? Ariara must have control of some bit of metal somewhere that she can use to lift herself out of that cage. Unless it has a top. Maybe she could use metal to make a shield and walk through? 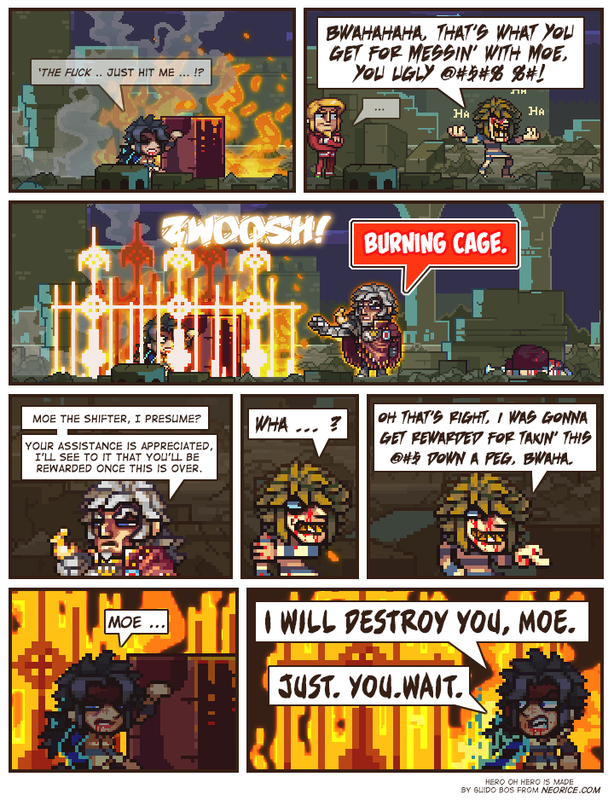 She doesn't have any metal on her, and I would assume that the Burning Cage does more than just create a few flaming bars. It's safe to say that they have magical restraining powers, I think.